Mitsubishi - a Japanese company perhaps more famous for heavy plant like diggers and bulldozers, as well as cars and home electronics - was one of the wave of mostly-Japanese manufacturers producing MSX machines - a unified software and hardware standard, where the Z80 CPU, General Instruments' AY-3-8910 sound, TI 9188 graphics (a combination which was considered by some as somewhat limiting) and Microsoft BASIC were the same on every MSX machine. 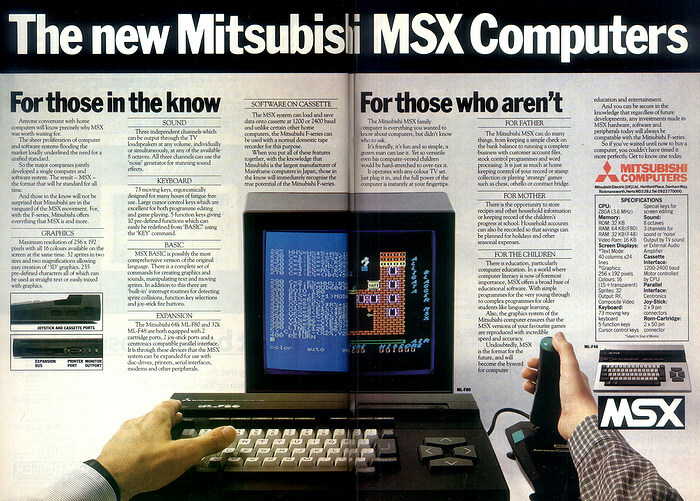 MSX was sponsored by Microsoft and also included manufacturers like Yamaha, Sony, Sanyo, Fujitsu, Canon and Toshiba. The US and European computer industry had been terrified for years of the impending entrance of the Japanese into the home and business computer market, but when it finally happened, it was not until the end of 1984 when the domestic 8-bit market was already saturated and the IBM PC was starting to establish itself as a standard in the 16-bit business computer field. So, in the end, MSX didn't have much of an impact, not that it did the incumbent computer companies much good as many of them had gone bust by 1985. Mitsubishi's parent company - Mitsubishi Electric Corporation - also had the dubious honour of winning Personal Computer World's "Press Release of the Year 1982" for its issue entitled "Mitsubishi Electric develops pattern-recognition software for sorting fish and cucumbers". The system, developed in association with yet another tentacle - Mitsubishi Kakoki Kaisha Ltd - used the newly-developed Melsort pattern-recognition software to "recognise sardines, herrings, anchovies and a variety of mackerel by shape, whilst grading them in to three sizes. The task of fish sorting, which used to require skilled human labour, in now done automatically. Fish up to 500mm in length and 150mm in width can be handled at a speed of up to 14,400 per hour". Not content with just fish, Melsort could also do cucumbers "according to thickness, length, curvature and shape".